Shops upon shops upon swarming roads. 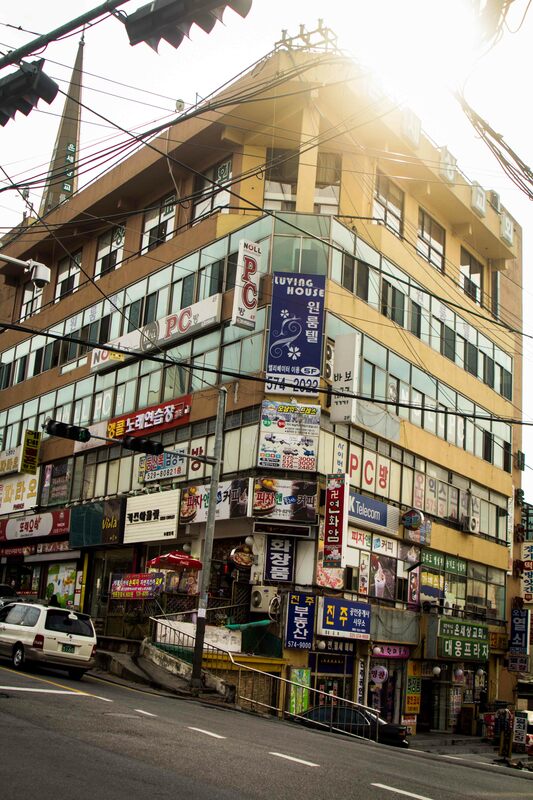 Standard for Korean accommodation/businesses. It has been our first day of teaching; as such, we are suffering physically, emotionally, intellectually and nutritionally. Never have I (or will I) doubt the benefit of being able to sleep in before a 2pm start time. Spending 7 hours alternating between smug pride, mild alarm and chronic despair has left us deeply self-righteous and entirely oblivious to anything outside of our flat and the local pizza house (note: we promise not to become those expats who avoid the local cuisine for our entire stay. We have, however, had enough dietary disasters for one week, and cannot yet judge the hangul advertising’s merit on the main street). Among our (often alarmingly so) enthusiastic students we have one Hung, and one Hwan. Naturally. We have three Lisas, five Jennifers, two Olivers and three Amys, which is apparently a natural part of Korean self-anglification. I have yet to process the deeper meaning behind Benoit and Shinee (pronounced ‘shiny’), however. For future reference – I promise to try desperately not to alliterate every one of my posts. One of the many Christian neon towers against the Namyangju wilderness. We have yet to explore.